Arbor Landing at Hampstead strives to make each meal memorable. We offer residents a restaurant-style dining experience that focuses on regional cuisine, comfort foods, and nutritious meals that cater to a number of diets. Residents are welcome to join us for three meals a day in our dining room. Our menu is full of flavorful entrees, salads, and desserts. Assisted living residents may also request to have meals delivered to their apartment, as well. Share your day with new friends at Arbor Landing at Hampstead or invite your family to join you for a meal in our dining room. Dining here offers you an opportunity to try out a new cuisine or treat yourself to your favorite comfort food. Our chefs do their best to cater to your tastes and diets and want you to have the very best dining experience while living here. Alternate menu items are always available to ensure there’s an option for every taste preference. Each Ridge Care community has a resident dining council that meets monthly to review the menu, make suggestions, and discuss potential changes. Residents have a great deal of influence over the menu, how food is prepared, and what is offered. Our menu offers tasty, healthy options for every taste palate. But, don’t take our word for it. Contact our team today to schedule a complimentary lunch or dinner at Arbor Landing at Hampstead. Family members are encouraged to visit our community for a meal with their loved ones. 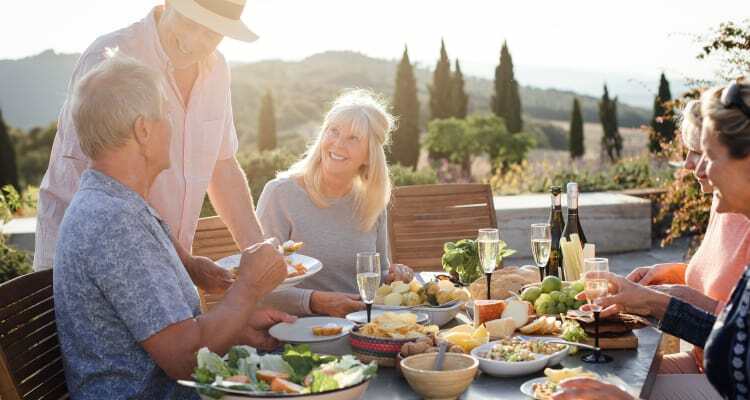 Whether it’s breakfast, lunch, dinner, or a special holiday meal, you’ll be proud to break bread with family and friends at Arbor Landing at Hampstead.